I have to make a disclaimer. I really only made these cookies to use in the meyer lemon semifreddo that I am making tomorrow. However, that is not to say that they were not delicious in their own right. 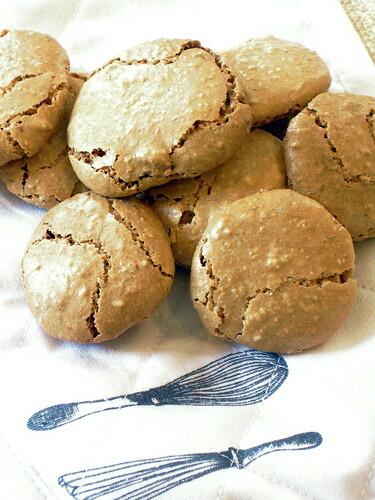 They are light, as would be expected from a macaron relative, but they also have a nice crunch from the ground almonds in the dough. I love the flavor of almond in just about anything, and these really tasted like almonds, which is definitely a good thing in my opinion. I cannot wait to see how they taste inside of the semifreddo. They were quite scrumptious sandwiched with the meyer lemon sorbet that I made earlier today, and I would imagine that a number of fillings, maybe a chocolate ganache or a lemon curd even, would be equally tasty. As I said with the lemon sorbet, these cookies really were a nice foil to all of the rich foods I have been consuming for the past week. Their crunchiness would be great dipped into a cup of coffee or eaten alongside a mug of hot cocoa. In the future, these would make great gifts, as they would hold up well in packages. Preheat oven to 350. Line a baking sheet with parchment paper. Pulverize almonds in a food processor with flour and powdered sugar. Whisk egg whites until they become frothy. Add cream of tartar and continue whisking until they hold shape. Gradually whisk in granulated sugar and beat until they form soft, rounded peaks. Fold the ground nut mixture and almond extract into beaten whites with a rubber spatula. USing a pastry bag fitted with a large plain 1/2-inch tip, pipe out the cookies in mounds about 1 1/2 inches in diameter. Bake for 35 minutes, until the macaroons have browned. Turn off oven, leaving the cookies in it to dry out for an additional 20 minutes. 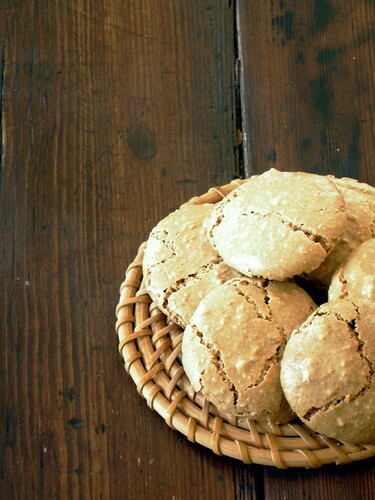 Remove amaretti from oven and cool completely.